At home on Earth, Caine is Hari Michaelson, a superstar whose adventures in Ankhana command an audience of billions. Yet he is shackled by a rigid caste society, bound to ignore the grim fact that he kills men on a far-off world for the entertainment of his own planet—and bound to keep his rage in check. 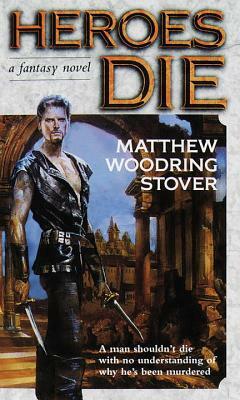 Matthew Woodring Stover is the acclaimed author of two previous fantasy novels, Iron Dawn and Jericho Moon. He is a student of the Degerberg Blend. This jeet kune do concept is a mixture of approximately twenty-five different fighting arts from around the world and forms the basis for Caine's combat style in the novels. He lives in Chicago, Illinois, with artist and writer Robyn Fielder. "DAY OF THE JACKAL MEETS LORD OF THE RINGS . . . A marvelous conspiracy thriller of worlds within worlds, where no one is necessarily who or what they seem." "Vivid . . . Well-plotted . . . [A] vigorous adventure story."